My sister Jean, known to many of you through her own blog, had her birthday while I was away on holiday, so I wanted to make her card and have it packaged up, so I could post it to her from UK before I moved on to Denmark. Because of that, it was rather a rushed job, which I know I could add some refinements to if I did it again, but I also knew she would not be too critical so I sent it anyway! 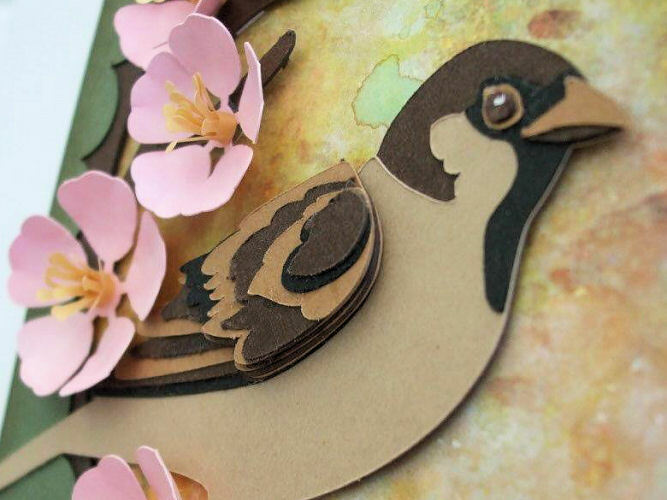 I had been browsing through a site that sells svg cutting files, mainly for 3D projects, and my eye was caught by a very realistic little sparrow sitting on a blossom branch. 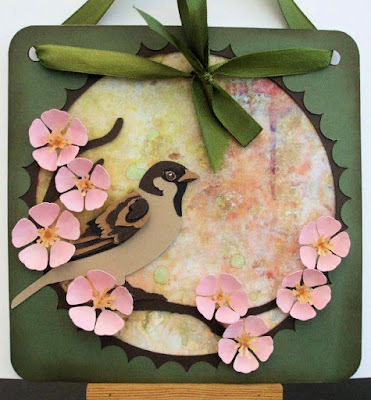 It turned out to be intended as a paper wall hanging, so I bought the file called Enchanted Sparrow Paperscape, from a site called simply svg cuts, and I decided to make it up and just use cut corners to slot it into a plain white card to send to Jean. Because it was all done in a bit of a rush, I packed it up and forgot to take any photos, but this weekend Jean sent me some, so here it is. The background was a piece of plain white card, dusted with a range of distress inks, and then sprayed with perfect pearls sour apples mica spray. There were then two layers of frame to cut, lots of little flowers and their centres, and the little bird which has nineteen individual pieces, thirteen of them being just for the wing! I was going to show you a map of the pieces but I have just realised it is probably copyrighted, so I had best leave it. But this close up shows the layers on the bird, and you can see that some of them are very tiny indeed. They are also very odd shapes, but I was pleased to find that it soon became fairly obvious which way they should go. Because I use the Designer Edition of the studio software with my silhouette cameo, I can import svg files and cut them straight away, so it was just a case of resizing everything together, so my hanging would fit on a reasonable size card, and sorting out which piece should be cut from which colour. It was a good opportunity to use up some very tiny snippets which I always have plenty of lurking in my boxes. If I made it again, and had more time, I think I might double layer some of the flowers, and add more shading to their petals, and maybe a little sparkle to their stamens too. Because I wanted Jean to be able to use this as a wall hanging if she wanted too, I did not add a sentiment to the front, but wrote inside the card instead. This one can definitely be linked up to Pixie´s Crafty Workshop. This little bird is quite realistic looking IRL and I love it, thank you. The inky background and and flowers are very pretty as well. Kate this is gorgeous - the sparrow is really realistic, and worth the work, and your background is perfect! Wow! thank you for entering the playground with this masterpiece!! It is absolutely stunning and you should be very pleased with it - I know that I would be if I made it. Mind you if I made it, it wouldn't look like that!!! This card is absolutely beautiful!!! Love how the pretty background is framed and how the little bird stands out so nicely against the background. Talk about detail, WOW! I think it's totally delightful Kate. I can see from Jean's comment that she was pleased with it too. Just catching up on the playground makes. Your bird picture/ card is lovely. Lots of patience needed here for all those fiddly pieces but well worth the time spent making it. Hugs Mrs A.